Following the July announcement of the Microsoft Common Data Model (CDM), we’re happy to make it available for preview today. The CDM is the Microsoft Azure–based business application model and storage mechanism for the Microsoft business application platform. The CDM comes pre-provisioned with a rich set of standard entities and plays an important role in our business application platform innovation focus to accelerate application development by power users. The CDM roadmap will continue to add and enhance definitions of standard entities, and will add integration capabilities for importing data from multiple sources. It will also include enhanced security and many more capabilities. For more context about the roadmap, review the introductory blog post. With the standard schema and integration capabilities, the CDM aims to bridge the data gap between the many business apps deployed in an enterprise. It is much more than a relational database: it has a meta-model that understands business primitives and semantics such as currency, amounts, and auto-number fields. It encapsulates core business concepts in a standard set of entities. Future iterations of the CDM combined with PowerApps will fundamentally change and accelerate how organizations build custom business applications. The goal for the CDM is to enable applications that will source data from multiple systems, join that data, aggregate it, and let users make decisions based on it. The CDM is integrated into the PowerApps management and authoring experiences. After you sign in to the PowerApps portal, you will see a new Entities option on the Manage tab. When you click Entities, you will be asked to create your CDM database, which you can immediately start to use in your apps and flows. The following video provides an overview of CDM integration into the PowerApps portal. Once the CDM entities are provisioned you can start browsing and working with the standard entities and sample data via interactive Excel. The Interactive Excel experience lets you quickly view, edit, and enter data before you build any applications. To open entity data in Excel, click the ellipsis (…) button next to an entity, and then click Open in Excel. The workbook that is provided will use the PowerApps Excel Add-in to read data from the CDM. 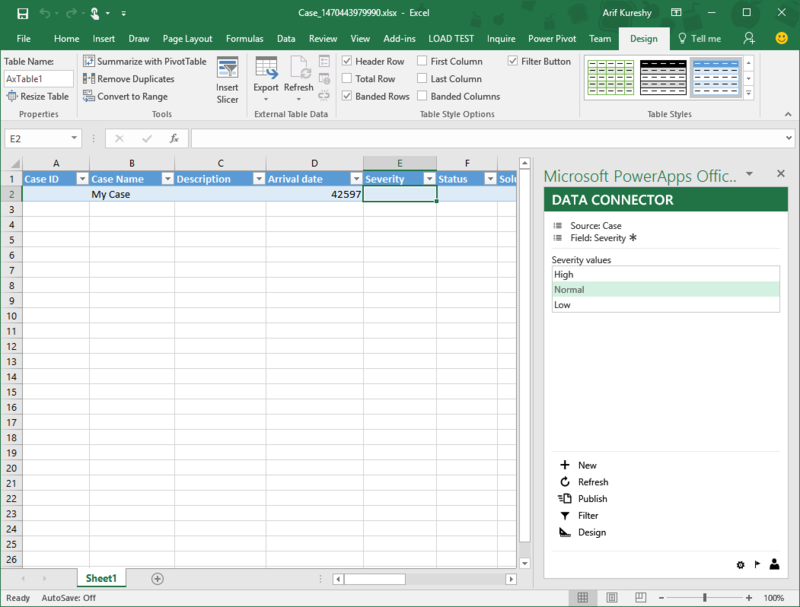 The Excel Add-in lets you filter, create, delete, and edit data. In addition to providing data to Excel, the add-in reads metadata from the CDM and supports rich data entry capabilities, such as calender based date pickers, relationship based lookups and enumerations in the add-in pane. This first preview version of the CDM contains a rich set of entities across some common domains. The entities are organized into five functional groups.
. We recommend that you explore the schema and data by using the Entity management experience in the PowerApps portal and integrated Excel experience. Your feedback will help us understand your requirements and deliver updates beyond the initial preview. Create an app from your data automatically creates an app by connecting to your CDM data source. Create an app lets you start from an empty canvas, which you can customize and connect to CDM data. Because the CDM is a first-party data source for PowerApps, there is no need to configure connectors before you develop your first application. The following videos will provide an overview of how to build apps with the CDM. Just like any other app built on the PowerApps platform, you can share your CDM-based apps with other users or security groups within your organization. In this preview, permissions to the database are automatically managed as you share the app. However, future iterations will introduce additional options to help secure data based on entities, fields, and records. Data authorization is done on the server tier, so only authorized users will be able to access CDM data based on the apps that you have shared with them. As you start to build and share apps, explore standard entities, and build custom entities, think about the benefits of having a business data store that is easy to provision, customize, and share. The CDM preview provides a business data store and much more. It also has a standard set of entities, data management tools, and basic security. This is a preview, and we know that our journey has just started – we are working feverishly to enhance the functionality. We will enable many more features soon, such as additional data types, an entity data browser and editor, and entity definitions for productivity scenarios. Look for the 1.0 version of the entity definitions with the PowerApps general availability release. The public preview of the CDM is available for you to use starting today, so get started by signing up at powerapps.com. After you start using PowerApps with the CDM, you can always get answers to your questions, report issues, and submit ideas by using the PowerApps community site. We’re waiting to hear your feedback.